You may have noticed telltale bulges in your walls and ceiling over time and wondered what they were. These are small circles that protrude from the drywall but not very far: usually no more than 1/8-inch. Often they crack the paint around them. They might even run in vertical or horizontal lines. Nail pops are cosmetic imperfections that sometimes show up in drywall ceilings and interior walls that have been fastened with nails. Nail pops rarely affect your wall's structure, though in great enough numbers your wall might lose a section of drywall. Hammering in the nail pops sometimes works but often not, because the core problem has not been solved. Find out the causes behind nail pops and how to fix them for good. Drywall today is largely installed with drywall screws. Drywall screws are brittle and sometimes snap, but they will never pop out. Instead, the nail pops in your ceiling and walls are caused by short drywall nails that are no longer firmly attached in the two-by-four studs. Most houses built prior to the 1970s that have not been subsequently remodeled will almost always have drywall hung with nails, not drywall screws. Made of galvanized steel and with a broad head, drywall nails generally range from 1 1/8-inch to 1 7/8-inch long. Even if you have walls that have been built after the 1970s, you might still have wallboard hung with drywall nails, since some drywall installers prefer to use nails. As the wood studs dry out over time, the wood fibers lose their grip and are no longer able to hold the smooth shank of the drywall nail. The nails protrude, usually bringing drywall compound filler and paint with them. It is usually fruitless to pound the nails back in place because the wood will not hold the shank. The basic idea behind fixing nail pops is to place drywall screws (not nails) on both sides of the nail pop. This effectively replaces the nail with the screws, but without the mess of digging out the nail. Know in advance that additional nail pops may form along the stud you are working on or those adjacent to it because your repairs are disturbing the wallboard and causing it to move. It helps, too, to have a strong light source aimed at a low angle across the wall, as this will help you quickly identify protrusions. Wearing safety glasses, use the hammer to drive the protruding nail back into the wall, being careful not to damage too much of the drywall around it. Be sure to use a smooth-headed hammer, not a hammer with a waffle or grid head. The result will be a small, round indentation in the wall. Secure the drywall to the wooden studs using two drywall screws, one on each side of the nail. Use the drill and a driver bit to drive a drywall screw into the wallboard, hitting the stud underneath until the screw head creases the drywall paper. Place another drywall screw on the other side of the nail pop. Both screws should be about 1 or 2 inches from the nail. In the previous step, if you were unable to hammer the drywall nail in and get it to stay in, the two drywall screws that you drive in this step usually will be strong enough to pull the drywall tight up against the stud. 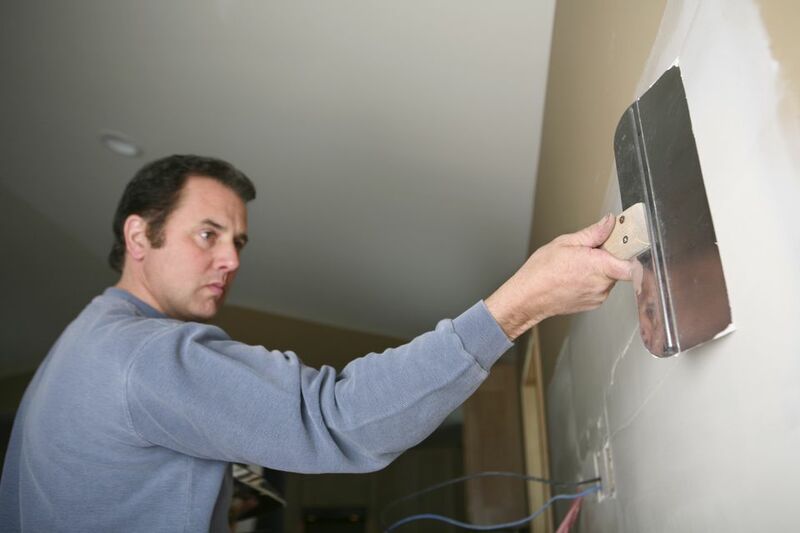 Use the drywall taping knife to apply a light layer of joint compound over the holes. Smooth the excess with the knife so that it is flush with the wall. At this point, do not worry if the indentations are still visible. Allow the joint compound to dry for two to four hours. Apply a second coat of joint compound. If the patch is not blending in well with the surrounding wall, use a broad feathering knife to draw a wide, thin coat farther out on the wall. Inspect the area. Joint compound shrinks when it dries, so it may be necessary to apply a third coat. Lightly sand the area with fine-grit sandpaper. Apply primer to the repair area, then paint.